Hello Internet, today is Friday, June 2nd, and yesterday we did two awesome shows at J. M. Olds Collegiate in Twillingate. Up and at’em first thing, we rolled into the school for a show at 9am. About 100 students poured in a few minutes after the first bell rang, and they were a totally lovely audience. Talk back was a quiet, but a few members of the drama club and some teachers stuck around after everyone was dismissed to chat with us afterwards. They were keen to see the boxes (every theatre enthusiast loves a good set made of boxes) and we wound up having quite a discussion about schizophrenia, the onset, the possible causes, the triggers, and the true story that the play is based on. Then we had 8 hours before the next show, so we went on a few adventures. First, we went looking for a lighthouse, since we’d been told that it offered a good panoramic. We found it eventually, but not before we stopped at another point just to have a look. The pack ice apparently goes out 40 miles, and the folks who live here are pretty tired of it, but I can tell you that I have about a dozen pictures of the ocean covered in ice. Here is one of those pictures. We did find the lighthouse, after, and took a bunch of photos of ice there, too. We were promised a panorama and were not disappointed. The lighthouse site is also home to a fudgery/gift shop, so obviously we had to go in. My peanut allergy kept me away from the homemade fudge, but there were a few pieces of fudge bought, and I did find an incredible Christmas ornament that needed documenting. This, friends, is Santa and a puffin wearing a Christmas hat. They are riding a humpback whale. Merry Christmas! Having reached the end of the road in one direction, we drove back the other way to continue our adventure. We thought we might go to Morton’s Harbour so that we could say we’d been “all around the circle,” but it turns out that MH is more than an hour’s drive from Twillingate, so we turned back to explore Twillingate some more. Passing J. M. Olds again, I made the team get out and have a picture taken with the sign promoting the evening’s public performance. The road not yet taken was the road to the Auk Island Winery, and although we couldn’t partake of the wine before the next show, we were drawn inside by the promise of wine-flavoured soft serve. There were two flavours available yesterday: Moose Juice (blueberry/partridgeberry) and Krooked Cod (blueberry/raspberry), and we tried both of them. By way of review, I would say that I would eat Moose Juice-flavoured ice cream again. After returning to the motel for some downtime, we returned to the school to set up for our evening performance. The organizers were hoping for 50 people, but about 120 turned out to see the show! We have been blown away by our incredible experience at J. M. Olds and are so grateful to have had the opportunity to play for the audience here and to chat with them about mental health. This is what it looks like when 120 adults come to see a play about mental health in a school gym. In case you were wondering. 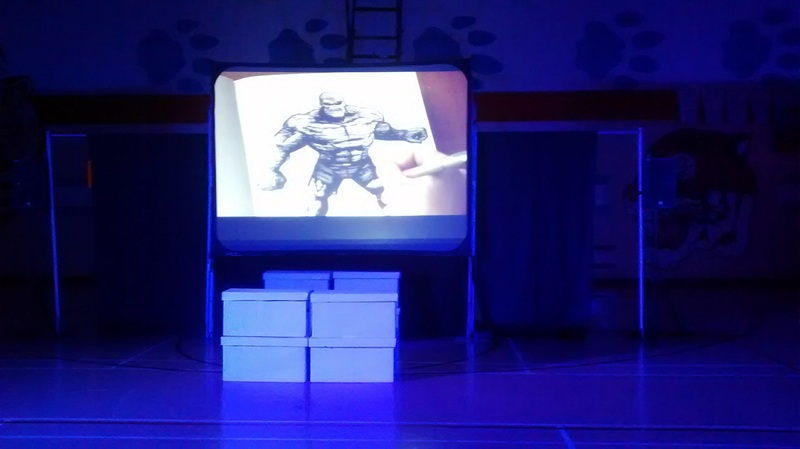 We have one more performance today at New World Island Academy, about half an hour from Twillingate.